The 22.3 megapixel Canon EOS 5D Mark III is Canon’s high quality Full Frame digital SLR, the follow on model to the extremely popular 5D Mark II. It shares many of the features of the more expensive Canon 1D X that we previewed at the Consumer Electronics Show, but at a much lower price. Canon was caught by surprise at the popularity of the 5D Mark II’s use as a filmmaking tool for TV shows and movies. The 5D Mark II was used in recent movies and TV shows such as Act of Valor, Red Tails, Walking Dead, 24, Hawaii Five-O and many more. The new 5D Mark III is not only upgraded to address picture quality, but is putting in features that will make filmmakers more productive. This model will be popular with photo journalists that require both photos and video. Professional Video Features: The HD movie mode can shoot Full 1080p HD Video at frame rates 1080p @30fps & 24fps, 720p @ 60 fps with manual exposure control. The movie function has been greatly improved by adding a headphone jack for monitoring audio while shooting. You can also monitor (on the LCD screen) the audio levels, and adjust them. With the external microphone jack, you have many audio options. The 5D Mark III includes two methods of synchronizing video with SMPTE-compliant timecode embedding. Using the new power of Canon’s Digic 5+ chip has reduced video artifacts such as chromatic aberration, moiré artifacting, and rolling shutter. In addition Canon has added more compression options that are better at higher bit rates than previously available. New options include ALL-I or IPB. We are excited about the ALL-I intraframe codec, since this will compress each frame of video individually (rather than a group of frames), and give you as close to uncompressed video as we have ever seen. This codec has a very high bitrate for maximum quality. HDMI raw output will be added with a new firmware upgrade (available in April 2013). The improved ISO will greatly help low light video taking. A new dedicated Movie/Live View button has been added to the camera. 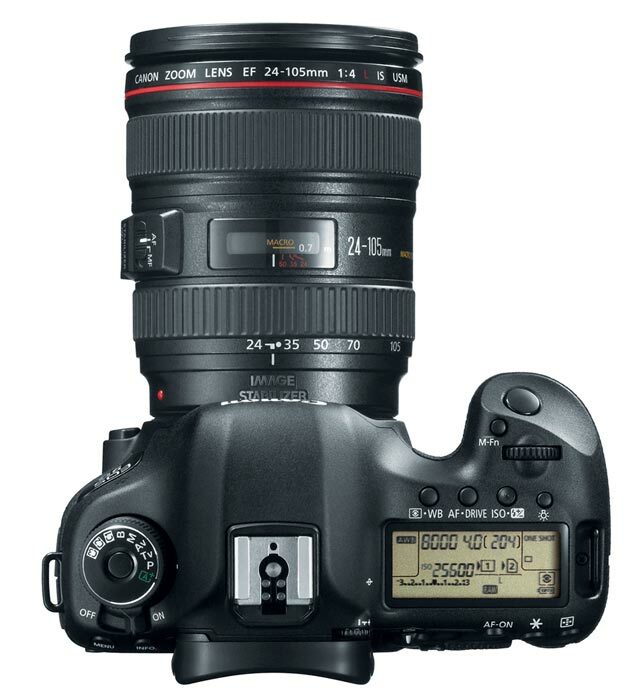 Canon has provided filmmakers with some important upgrades and this will be very popular with independent filmmakers. Advanced Features: The Native ISO has greatly increased to ISO 100-25,600 (expandable to 102,400), Burst mode of 6 frames per second, Upgraded Autofocus to 61 AF points, HDR Mode (High Dynamic Range), Shutter durability of 150,000 cycles. The built-in mini HDMI port can hook up to an HDTV or monitor. The back of the camera features a high resolution 3-inch LCD screen (1,040,000 pixels). Use the large LCD with the Live View Function for composition of both pictures and video. EOS Dust Removal System removes dust from the full frame sensor automatically. 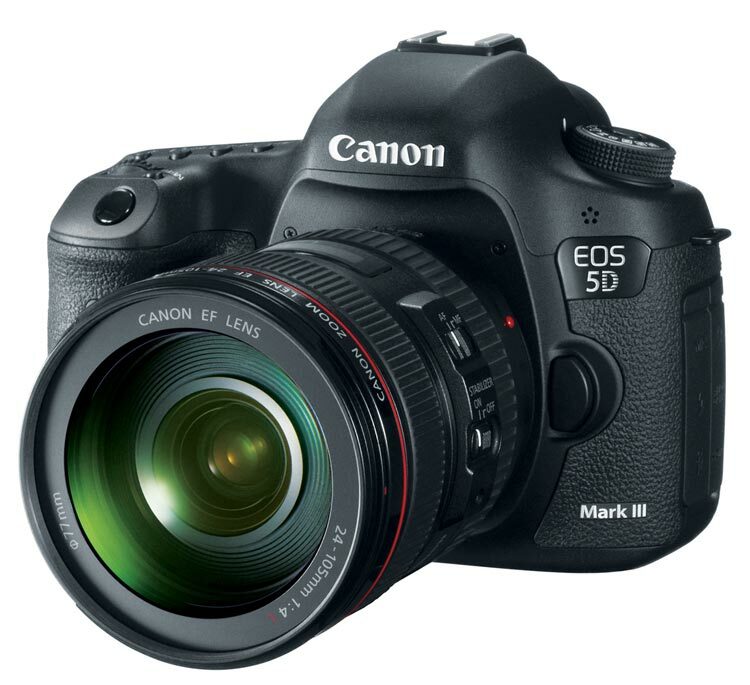 The 5D Mark III’s magnesium alloy body is dust and weather resistant. 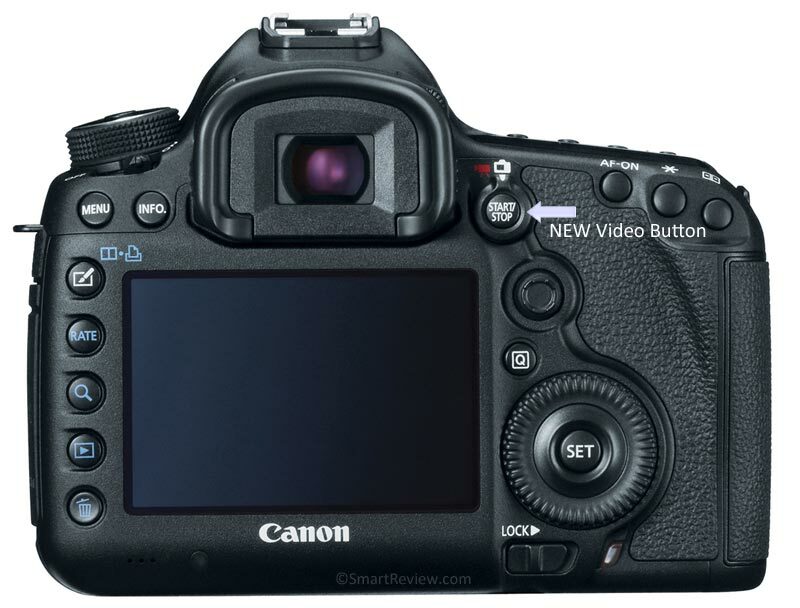 Upgrade features from the 5D Mark II: ISO goes from 6400 to 25600, 61 AF points (up from 19), Burst mode to 6 fps from 3.9, added a Headphone jack, Manual audio level monitoring and adjustment, Dual SD and CF cards, HDR Mode, Time code, More video compression options. Reduction in chromatic aberration, moiré artifacting, and rolling shutter in video mode. Upgraded to 22.3 megapixels, Digic 5+ processor (17x faster than Digic 4), 29 minutes of shooting time per clip (up from 12 minutes). New LiveView/Movie Mode button has been added. Uncompressed HDMI output support (with April 2013 announced firmware update). Magic Lantern Firmware for 5D Mark III: The big news for those that push the capabilities of their camera is the Magic Lantern firmware’s ability to capture RAW video. This camera is the only camera via Magic Lantern to be able to capture full 1080p (24fps) video in raw format. The results are stunning (better colors, sharper, higher dynamic range), but does require a lot more time for processing in post. You will also need a 64GB 1000x compact flash card, that will only store about 12 minutes of raw video. Memory Cards and Battery: Dual CF and SD Card Slot. Compatible with UDMA CF cards; SD, SDHC, and SDXC Memory Cards. Lithium-ion battery LP-E6 (included). USB 2.0. Dimensions: 6.0″ x 4.6″ x 3.0″ ( 30.3 ounces – body only). Smart-Review Commentary: Canon’s 5D Mark III is a greatly improved camera for both photo and video. 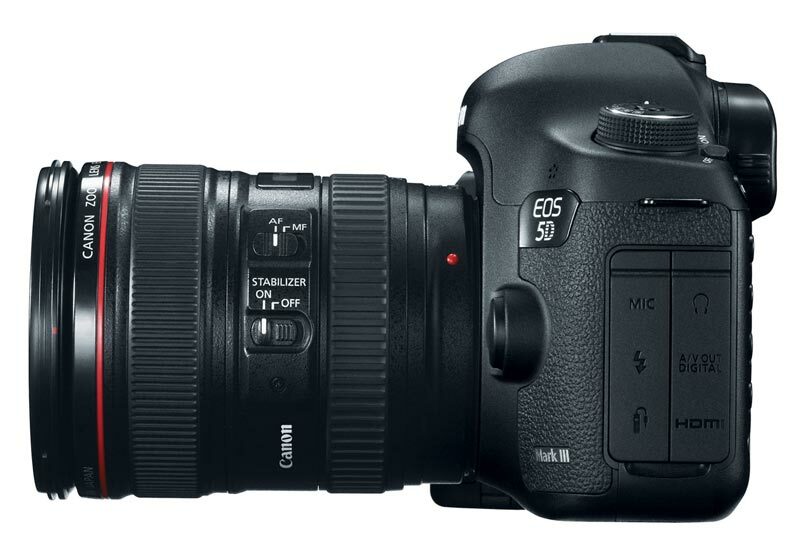 The upgraded ISO will help to get low light shots and video not possible with the 5D Mark II. The huge improvements for video will keep Canon at the forefront of video filmmaking. Absent from this camera initially was raw video output in HDMI, but this feature will be available with an April 2013 firmware update. The new ALL-I video codec should keep most people very happy with this camera as you can store the best quality next to raw video right in the camera, keeping it less bulky than if you had an external recorder hooked up to the HDMI port. The ALL-I codec records at an astonishing rate: 91 mb/sec bitrate. This is compared to AVCHD which tops out at 24mb/sec, and the 38mb/sec native compression of the 5D Mark II. This is the first EOS camera with a headphone jack. This was something that many were asking for from Canon. You can now silently adjust levels with the control dial/touch pad during recording. Some people were disappointed that the camera only went up 1 megapixel in resolution. However, we feel Canon made the right decision, as this camera has a much higher ISO and dynamic range than it would if they bumped up the megapixels substantially. If you are buying this camera for pictures, you will be quite pleased with the higher ISO (4x higher than the 5D Mark II), more AF points, Dual cards (CF and SDHC), and faster burst rate mode (6 fps). The dual memory cards can be set to record to the other once one is full, or record to both cards at once, making a realtime backup. Speed Improvements: One reason that the Canon 5D Mark III is able to achieve substantial improvements in features and speed is the introduction of the Digic 5+ chip. It is 17 times faster than the older Digic 4 chip found on the Mark II. This additional power will be able to process and optimize images and video better before it writes to to the memory card. Unlike the Nikon D800, the 5D Mark III features SMPTE-compliant timecode which will help to synchronize audio when doing multiple camera video shots. The camera now has the power to reduce moir‚ color artifacts, and even the rolling shutter effect in videos. The length of a single clip of video has improved from 12 minutes to 29 minutes. When the 29 minutes is up, you simply start a new clip. This is a worthy upgrade of 5D Mark II, and we believe is one of the best DSLR cameras at a substantial discount from the Canon 1D X. It is a SmartReview Top Pick.